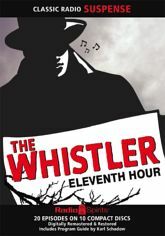 On a cold, rainy night in the darkest shadows of your imagination, fate is waiting for you�in the form of The Whistler! Join him for twenty excursions into the realm of those nameless terrors of which we dare not speak! Bill Forman plays the role of the omniscient storyteller, offering terrible tales from the perspective of the very culprits themselves. Yet somehow, even though you know who's guilty, there is always a shocking twist at the end!